GPAS-140 is transparent polyethylene, static dissipative, amine-free and non-corrosive. 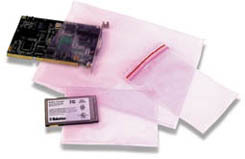 Under normal storage conditions the film and bags will remain permanently antistatic. Elimination of amines from the resin has eliminated the greasy feeling of the surface typical in antistatic bags. This allows the bag to be written on and opened more easily. It eliminates corrosion caused by outgassing.